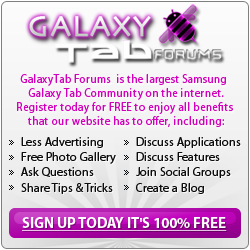 This video features 10 helpful tips and tricks for using the Samsung Galaxy Tab 10.1. I was having difficulty finding much content on YouTube and other online sites, so I thought I would help contribute by making this video. The steps I've provided should be easy to follow along, but if you have any questions please leave a comment on my YouTube channel. Also, if you have additional tips you would like to share please leave a comment. karte, ioflying, buerkletucson and 5 others like this. Thanks for posting these tips. This kind of info is very helpful. I'm glad you found the video helpful! I will do my best to add more content when I can. Yes this was very helpfull - thank you . I am just still trying to figure out how to create different folder for pictures. I would like to have a work folder and another folder or two for personal ? Thanks for posting this video! I forwarded it to a few of my friends who will find this helpful. Thanks for the positive feedback everyone. I'm working on a second video that will hopefully be up soon. Will post a link to it in this forum. very useful! thanks! love the full screen browser! keep them coming!